I decided to start up the 52 Ancestors in 52 Weeks project again. I last did it in 2014, even though I didn’t make it all the way through. Even if I don’t again this year, it still allows me to dig deeper into specific ancestors. As always, you can view all of the 52 ancestors here, updated as I post. The first ancestor of 2017 is my paternal 3rd-great-grandmother, Pauline Henrietta (THOMPSON) FIRMENICH, also known as Polly. I’m related to her via my father → his mother (Mary Jane CORRIGAN) → her father (Maurice CORRIGAN) → his mother (Emma Jane FIRMENICH) → her mother (Polly THOMPSON). Polly Thompson was born on 5 May 1849 in the town of Granville, Milwaukee County, Wisconsin. She first shows up in the 1850 Census for Granville at one year old with her parents William and Frances THOMPSON and siblings. Granville is still mentioned today, though more of as an area of Milwaukee than an incorporated location. It is on the north side of Milwaukee County near today’s Brown Deer and Menomonee Falls. By the time the 1860 Census rolls around, Polly and her family have moved north on to the town of Morrison, Brown County, Wisconsin presumably with the Firmenich family who also lived in Granville. On February 11th, 1867, Polly marries one of the Firmenich men by the name of Mathias FIRMENICH. According to the Wisconsin Marriage Certificate, the marriage took place in the nearby town of Holland and the witnesses were Chas F Cross and Polly’s sister, Emilia Thompson. Their first child, Albert, is born in nearby Wrightstown in March 1868. Two more followed before the birth of my great-great-grandmother, Emma Jane, in June 1873. When all was said and done, they had a total of 13 children. According to the obituary of Emma Jane in 1941, the Firmenich family moved from Wrightstown in 1882, finally settling way in the north of Wisconsin into the forests of Ashland County. Tragedy struck in early September 1885 when an outbreak of Diphtheria plagued the family. Within only a few days, the disease took the lives of at least three of their children, though probably four, including Hattie (6), Edmond (4), Sarah (2), and possibly Anna (8). Adding to the chaos was the fact that Polly was pregnant during this time as their daughter Rose was born there on September 20th, 1885. Polly shows up again in the 1900 Census and 1905 Wisconsin State Census in Ashland. In 1910, Polly passes away. I have no exact date, just the date from her headstone at Saint Agnes Cemetery in Ashland where she is buried near the children she lost in 1885. She is not listed in the 1910 Census, Mathias being listed a “Widowed.” The Census for their home was taken on April 30th, 1910, so we can assume she passed away sometime before then. I have only one photo of Polly, which is the from the family photo on this post. I estimate the photo was taken sometime around 1895 based on the ages of the children and (not joking) Mathias’ beard length. Something new I’d like to add to these posts this year is determining if and how DNA may play a role in my relationship. I have yet to find any proven DNA that I share directly with Polly. I do have matches from that side of the tree that share Polly as an ancestor with me, but we don’t yet know where those chromosomes or positions may be. I don’t have a lot of information on Johann. His birth date of 1792 in Prussia is estimated from US Census records (though, one lists him as being born in France.) There is a promising record over at the Germany Births and Baptisms, 1558-1898 collection at FamilySearch for a Joannes Petrus Firmenich born in 1794, but without some more info, I can’t say for certain. Though, the Firmenich name is not very common, so when I do find it, it’s usually somehow involved. According to the Germany Marriages, 1558-1929 index at FamilySearch, he married Anna Maria VOISSEL on 30 Mar 1832 in Buervenich, Rheinland, Preussen, which looks to be near Zülpich in North Rhine-Westphalia, Germany. This also matches up with the birth location of their son, and my ancestor, Mathias Balthazar Firmenich, in Eicks in 1842, which is nearby. I found a record in the Wisconsin Deaths from 1820-1907 for a Peter Firmenich on 18 Nov 1872, which I’m assuming is him as it is close to the location where he was last located in Brown County, Wisconsin. I have yet to find his burial location. This post is 36 of 52 in the “52 Ancestors in 52 Weeks” Challenge” begun by Amy Johnson Crow. I’m going to participate in this week’s Sunday’s Obituary theme. This is the obituary for my great-great grandmother, Emma Jane (FIRMENICH) CORRIGAN in from April 28, 1941. I’m not sure exactly which newspaper since I found the article in my grandmother’s collection and she didn’t note it. If I had to guess, it’s probably from a local Ashland, Wisconsin newspaper. Mrs. Emma Cook, 67, of 109 North Ellis avenue, a resident of Ashland and the Chequamegon region for the past 59 years and wife of the late George S. Cook, former city street commissioner, died Monday evening at her home following a lingering illness. The former Emma Firmenich was born in Wrightstown, Wisconsin, on June 29, 1873, but moved with her parents to Ashland in 1882. The Firmenich family lived in Ashland for a few years and then moved to Sanborn. She was married to Thomas Corrigan in 1892 at Sanborn where the couple lived until 1905. They then moved to Ashland and lived near the cemetery on Sanborn avenue for several years. Mr. Corrigan died in 1916, but his wife continued to live in their home until 1926 when she moved to Milwaukee. Six years later she returned to the city and in 1932 was married to Mr. Cook in Ashland. Mr. Cook died on December 5, 1940. She was a member of the St. Agnes church, the Altar Society and the Old Settlers’ Club. Survivors are twelve children, Edwin and Sadie of Ashland; Maurice, Clayton and Mrs. E. H. Olson of Iron Mountain, Michigan; Henry, Mrs. Norbert Enders (Lenore) and Mrs. Ed Strelka (Ethel) of Milwaukee; Mrs. Harry Nantais (Beatrice) of Dearborn, Michigan; Frank of Rivera, Florida; Mrs. Joseph Maurer and Mrs. Mary Foster of Detroit; four sisters, Mrs. A. F. Anderson and Mrs. Joe Fabro of Ashland, Mrs. William McKindley and Mrs. Thomas Gorman of Grand Coulee, Washington; and one brother, Henry Firmenich, Baudette, Minnesota. Funeral services will be held at 8:30 a.m. Friday at the Cook home and at 9 a.m. at St. Agnes church. Interment will be in St. Agnes cemetery. The body will be removed from the Wartman Funeral Home to the Cook residence on Thursday where is will lie in state until time of services. Use your pedigree charts or your family tree genealogy software program to find the person with that number in your ancestral name list (some people call it an “ahnentafel”). Who is that person? Write about it in a blog post on your own blog, in a Facebook note or comment, or as a comment on this blog post. If you do not have a person’s name for your “roulette number” then spin the wheel again – pick a grandmother, or yourself, a parent, a favorite aunt or cousin, or even your children! For my grandfather, I chose my maternal grandfather who is still living. As of today, he is 85 years old. Divided by 4 that is 21.25, so rounded to 21. She lost 4 of her younger siblings in September 1885 due to a Diphtheria epidemic that hit Wisconsin. She was married three times. To my great-great grandfather, Thomas Corrigan, and then to T E Martin and George S Cook. She did not have more children besides the ones born during her first marriage. 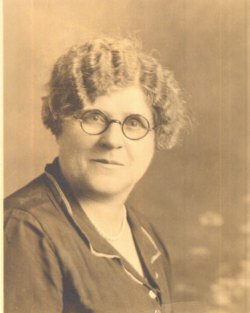 She lived in Milwaukee for a short time with 4 of her adult children according to the 1930 census, then moved back north to Ashland by 1932 after her second husband died. 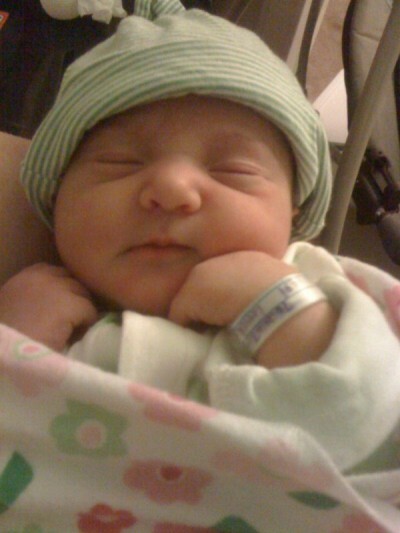 It’s been 5 days since Aerissa was born. Today is the day that she was scheduled to be born. We were supposed to be going in last night to start the process. It’s still 6 days from her original due date, which was November 10th. Since she’s very healthy, I’m glad she came early. The other day I finally added her to my family tree software, which felt really good. For one, it finally merges my wife’s tree and my tree together. Now I do feel more of a connection to her ancestors now that they are the ancestors of my daughter. Her maternal 5th-great-grandfather, Peyton WEY. Born in Fauquier County, Virginia in 1805. He lived to 76 years of age, passing on 4 May 1882 in Wisconsin. Her maternal 4th-great-granduncle, Thomas Peyton WEY, son of Peyton WEY. Born in Virginia in 1835. Her paternal 4th-great-grandaunt, Elisabeth Maria FIRMENICH, sister of Mathias FIRMENICH. Born in Eicks, Rheinland, Prussia in 1844. She later married August GRIEPENTROG. Her twin paternal 7th-great-grandaunts, Marie Therese GRIGNAC and Marquerite GRIGNAC. Born in Cap-Santé, Quebec, Canada in 1748. Since I had so much fun setting up my single ancestor site, Everything I Know About Frank Zalewski, I thought I would set up another one for another individual in my tree. Once again, it’s an individual from my paternal line, my 3rd-great-grandfather Mathias Balthazar Firmenich. I already had a lot of information on Mathias, which is one reason I decided on him. There is always missing information, which is one reason that these projects are helpful. It requires me to comb through all of the information I have and put it in order. I usually end up finding some detail that I had missed earlier. The sites also get to put the visitor into the life of someone who lived in the past and to see what they went through. Mathias’ life was pretty full. From immigrating to America at a young age to traveling hundreds of miles to a new home to dealing with the loss of children during a disease outbreak, he had been through a lot. 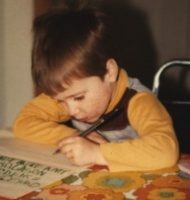 Take a journey and learn more about Mathias on my new site, Everything I Know About Mathias Firmenich. The important dates in my family history for this week (a day late.) As always, you can find this info on the Dates & Anniversaries page. 1789 – Married – Johannes VENNINGER & Elisabeth FLECK – Johannes and Elisabeth are my wife’s 5th-great-grandparents on her father’s side. They were both born in Baden, Germany. They had 8 children, including her ancestor Elisabetha VENNINGER. Johannes passed away in 1834 and Elisabeth in 1837. 1640 – Born – Major William VAUGHAN – William is my wife’s 9th-great-grandfather on her mother’s side. He was born in Glamorganshire, South Wales. In 1668, he married Margaret CUTTS. In the book “The Genealogical Registry of the Butters Family” it says William “came to New England from London about 1664. He was elected Constable in 1665, Lieutenant of Cavalry in 1672, Captain 1680, Major Commanding, 1681, one of the Council of New Hampshire 1682-1690, Treasurer of Province 1696-1698. He married Dec. 8, 1668, Margaret, daughter of Hon. Richard Cutt, son of Richard Cutt, Esq., of Grondale Abbey, Arkesden, Essex county, England.” He passed away in about 1690. 1910 – Died – Pauline (THOMPSON) FIRMENICH (right) – Paulina is my 3rd-great-grandmother on my father’s side. She was born 5 May 1849 in Granville, Milwaukee Co., Wisconsin (now Brown Deer, Wisconsin.) She married Mathias FIRMENICH in 1867 in Brown County, Wisconsin and they had 13 children. Paulina outlived four of her children who died of Diphtheria in 1885. She passed away in Morrison, Brown Co., Wisconsin and is buried at St. Agnes Cemetery in Ashland, Ashland Co., Wisconsin. This is my father’s birthday. Happy Birthday, Dad! 1891 – Married – Frank F BRAATZ, Sr & Margaret STEARNS – Frank and Margaret are my great-great-grandparents on my father’s side. They were married at Bear Creek, Outagamie Co., Wisconsin. Together they had 5 children, including my great-grandmother Agnes (BRAATZ) CORRIGAN. Margaret died in 1943 and Frank in 1948. They are buried at Mt. Hope Cemetery in Ashland, Wisconsin. 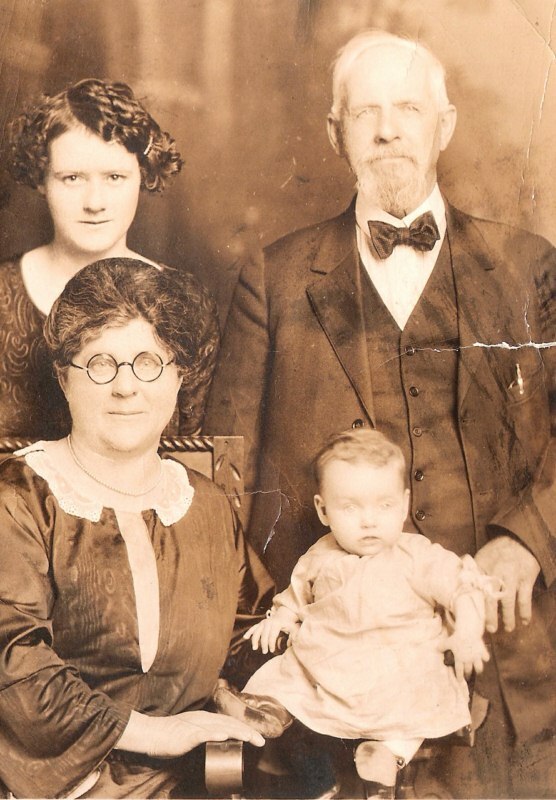 1926 – Died – Carl F H LAST – Carl is my great-great-grandfather on my mother’s side. He was born on 26 Sep 1851 in Doeringshagen, Pommerania (which is now located just northwest of Żabowo, Goleniów County, Western Pomerania, Poland.) He married Augusta LUEDTKE in 1883 in Milwaukee Co., Wisconsin and together they had 16 children. Carl passed away in Port Washington, Ozaukee Co., Wisconsin and is buried there at Union Cemetery. This is a “4 Generations” shot of the Firmenich -> Corrigan -> Olsen line. Included is my 3rd-great-grandfather, Mathias FIRMENICH; his daughter and my great-great-grandmother, Emma Jane (FIRMENICH) CORRIGAN; her daughter, Clarice (CORRIGAN) OLSEN; and Clarice’s daughter, Renee. The photo was taken in 1924. Click the photo for a a larger view. Here are these week’s important dates. As always, you can view these whenever you like on the Dates & Anniversaries page. Happy birthday to my grandmother, Mary Jane, and her twin brother, Tom! 1941 – Died – Emma Jane FIRMENICH – Emma Jane is my great-great-grandmother on my father’s side. She was born on 23 Jun 1873 in Wrightstown, Brown Co., Wisconsin. She married Thomas CORRIGAN in 1892 and they had 9 children, including my great-grandfather, Maurice CORRIGAN. After Thomas died in 1915, she married twice more before her death. She died in Ashland, Ashland Co., Wisconsin and is buried there at St. Agnes Cemetery. 1756 – Died – Laurence HENRY – Laurence is my 8th-great-grandfather on my father’s side. He was born about 1690 in Vaivre, Haute-Saône, France. He married Jacques GRANGIER in 1714. He passed away in Menoux, Haute-Saône, France. 1866 – Born – Margaretha STEARNS – Born Barbara Margaretha Magdalena STEARNS, she is my great-great-grandmother on my father’s side. She was born in Württemberg, Germany and after immigrating with her family to Wisconsin, she married Frank F BRAATZ in 1891. 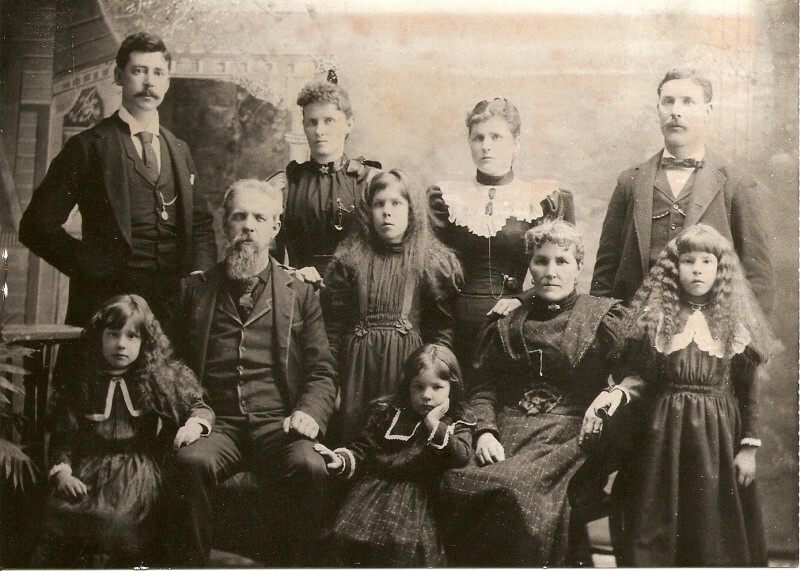 Together they had 5 children, including my great-grandmother, Agnes BRAATZ. She passed away in 1943 in Ashland, Wisconsin. 1941 – Died – Emily M TROKA – Emily is my great-grandmother on my father’s side. She was born on 5 Jan 1896 in Milwaukee, Wisconsin to Joseph & Clara (SZULTA) TROKA. She married Joseph ZALEWSKI on 25 Jun 1919 and they had 3 children. Emily died suddenly of a stroke on May 1st, 1941 at only 45 years of age. I plan on adding major events for both my family tree and my wife’s family tree from now on. That should help some of those less busy weeks. As always, you can find all of this information yourself on the Dates & Anniversaries page. 1892 – Married – Thomas J CORRIGAN & Emma Jane FIRMENICH – Thomas and Emma are my great-great-grandparents on my father’s side. They were married at Sanborn, Ashland Co., Wisconsin. This was Thomas’ second marriage as his first wife died in about 1890. Thomas and Emma had 9 children, including my great-grandfather, Maurice CORRIGAN. Thomas passed away just before their last child, Sadie, was born in 1915. Emma later re-married 2 more times before she died in 1941. 1999 – Died – Richard ZALEWSKI – Richard is my grandfather on my father’s side. He was born 9 Dec 1921 in Milwaukee, Wisconsin to Joseph & Emily (TROKA) ZALEWSKI. He married my grandmother, Mary Jane CORRIGAN, on 11 Oct 1947 in Milwaukee. He passed away in Cedarburg, Ozaukee Co., Wisconsin and is buried there at St. Francis-Borgia Cemetery. His death was one of the main reasons I got into genealogy in the first place. 1678 – Born – Anna Maria LUDWIG – Anna Maria is my wife’s 8th-great-grandmother on her father’s side. She was born in Kurnbach, Baden, Germany. She married Johann Phillip NAST in 1703 and had 7 children. She passed away on 3 May 1748 at Kurnbach, Baden, Germany. 1740 – Born – Nathaniel SHANNON – Nathaniel is my wife’s 6th-great-grandfather on her mother’s side. He was born in Portsmouth, Rockingham Co., New Hampshire to Nathaniel & Alice (FROST) SHANNON. He married Ann B CARD in February 1761. He passed away in September 1792 is Portsmouth. 1800 – Born – Antoine Joseph CALONNE – Antoine is my wife’s 4th-great-grandfather on her mother’s side. He was born in Grand-Leez, Namur, Belgium. He married Marie Eleanore Josephe ETIENNE in 1821. He passed away on 9 Dec 1870 in Grand-Leez. 1900 – Died – Charlotte STRASSMAN – Charlotte is my 3rd-great-grandmother on my mother’s side. She was born 20 Jul 1817 in Germany. She married Johann W G LAST sometime before 1850 in Germany before emigrating in 1857. She passed away at Grafton, Ozaukee Co., Wisconsin and is buried at Union Cemetery in Port Washington, Ozaukee Co., Wisconsin. 1722 – Born – Thérèse DARD – Thérèse is my 7th-great-grandmother of my father’s side. She was born at Menoux, Haute-Saône, France. She married Pierre Francois QUINET in 1751 and had 7 children. She presumably passed away in France, as did her husband. 1927 – Died – Johann THIELKE – Johann is my great-great-grandfather on my mother’s side. He was born 26 Oct 1843 in Schwerin, Mecklenburg, Germany. He immigrated with his family in about 1854. He married Wilomene C RATHKE in 1891 and had one child, Arthur. 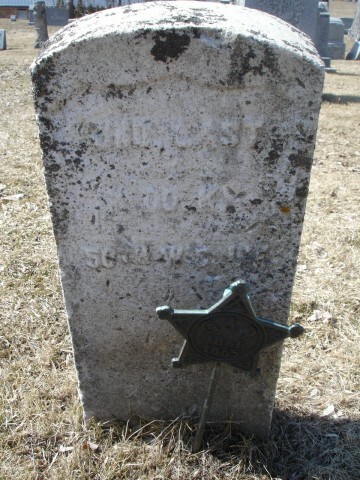 He passed away at Grafton, Ozaukee Co., Wisconsin and is buried there at St. Paul’s Cemetery. Weekly history for my family tree. As always, you can view these manually at the Dates & Anniversaries page. 1890 – Died – Maria (BRAATZ) KLEGIN – Maria is my 3rd-great-grandmother on my father’s side. She was born 15 Feb 1842 in Schoenwalde, Germany. I’m not sure which Schoenwalde, since there are a few, but I am working to narrow it down. She married Wilhelm BRAATZ in Germany and then emigrated to America in about 1868 with their first son, Frank BRAATZ. She is buried at Little Wolf Cemetery in Manawa, Waupaca Co., Wisconsin. 1832 – Married – Johanna Peter FIRMENICH & Anna Marie VOISSEL – Johann and Anna are my 4th-great-grandparents on my mother’s side. They were married in Buervenich, Rheinland, Pruessen. Together, they had 6 children including my ancestor, Mathias FIRMENICH. Six of them were born in Prussia and only Charles was born in Wisconsin after they immigrated in 1847. Johann died in 1872 in Brown Co., Wisconsin and Anna probably died sometime before 1860 since that’s the last time she is in the census records. 1829 – Born – Marie Desiree (LOOD) DEBROUX – Marie is my 3rd-great-grandmother on my mother’s side. She was born in Piétrebais, Walloon Brabant, Wallonia, Belgium. She married Jean Joseph Desire DEBROUX in 1854 and had one child, Victorie, before emigrating to Wisconsin in the 1850s. They were known better as Desire and Desiree in Wisconsin, as records and their headstones show. Desire passed away in 1912 and Desiree in 1919. They are buried together at St. Joseph’s Catholic Cemetery in Norwood, Langlade Co., Wisconsin.